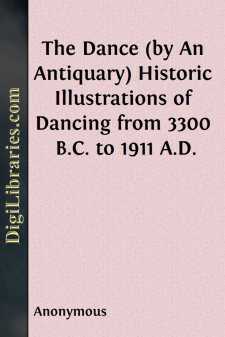 CHAPTER I. Egyptian, Assyrian, Hebrew, and Phoenician Dancing. The Ritual Dance of Egypt. Dancing Examples from Tomb of Ur-ari-en-Ptah, 6th Dynasty, British Museum. Description of Dancing from Sir G. Wilkinson; of the Egyptian Pipes and Hieroglyphics of Dancing, &c. Phoenician Round Dances, from a Limestone Group found at Cyprus, and Bronze Patera from Idalium, Cyprus. Fig. 2: Greek figures in a solemn dance. From a vase at Berlin. The earliest accompaniments to dancing appear to have been the clapping of hands, the pipes, the guitar, the tambourine, the castanets, the cymbals, the tambour, and sometimes in the street, the drum. Fig. 3: The hieroglyphics describe the dance.